Winners: The ADA announced the winners of its second 10 Under 10 Awards, which honors new dentists making their mark on the profession. From left (top), Drs. Antonina Capurro; Tim Treat; Courtney Burrill; Brian Hathcoat; Amanda Fitzpatrick; (bottom) Jason Tanguay; Danielle Riordan; Onika Patel; Dan Hammer; and Kadambari Rawal. 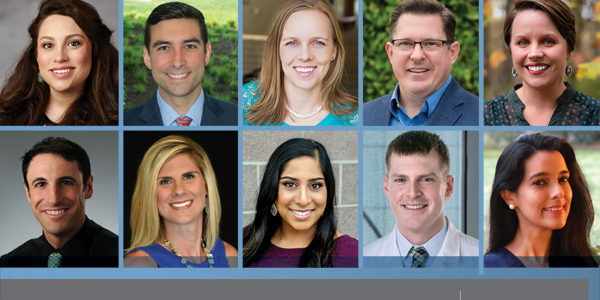 Selected by the ADA New Dentist Committee from more than 120 nominations, the winners showcase the devotion and time new dentists have put towards their profession, said Dr. Lindsay Compton, chair of the Subcommittee on New Dentist Engagement, which selected the winners. Nominees and winners had to be active ADA members who graduated between 2009 and 2018. Dr. Courtney Burrill, of Eagle River, Alaska. A U.S. Air Force veteran, Dr. Burrill continues to serve in the Alaska Air National Guard, initiated the University of Alaska pre-dental program and graduated from the ADA Institute of Diversity in Leadership in 2018. Dr. Antonina Capurro, of Las Vegas. Dr. Capurro is a leader in dental education and advocacy in Nevada, serving as Nevada State Dental Health officer, leading the Medical Miles for Rural Smiles initiative and helping design the D.M.D.-Masters in Public Health Fast Track program. Dr. Amanda Fitzpatrick, of LaPlata, Missouri. Dr. Fitzpatrick serves as co-chair for a local Mission of Mercy and teamed with the county health department to conduct annual school screenings and fluoride treatments for children in eight area schools. Dr. Dan Hammer, of Fort Worth, Texas. Dr. Hammer is a diplomate for the American Board of Oral and Maxillofacial Surgery, a Maxillofacial Oncology and Reconstructive Surgery fellow and a Navy officer. In addition, he is a grant-funded researcher who evaluating a nonoperative treatment of medication-related osteonecrosis of the jaw. Dr. Brian Hathcoat, of Moraga, California. Dr. Hathcoat a volunteered at the Berkeley Free Clinic for six years before taking over as dental director. Most recently, he co-founded Oakland, California-based Just Health 510, a program that helps provide complete oral health care regardless of a person’s ability to pay. Dr. Onika Patel, of Scottsdale, Arizona. Dr. Patel testified before the Arizona state legislature on new dentists’ perspectives on dental therapy. In addition to advocacy, Dr. Patel serves in the ADA Council on Ethics, Bylaws and Judicial Affairs and as an ADA alternate delegate. Dr. Kadambari Rawal, of Boston. Dr. Rawal has been involved in research including standardizing oral health care protocols at long-term care facilities, end-of-life dental service utilization and geriatric dentistry. In addition, she provides free dental care to women, children and the elderly and teaches geriatric dentistry in her home country of India. Dr. Danielle Riordan, of St. Peters, Missouri. Dr. Riordan is a constant presence in Give Kids A Smile, Donated Dental Services and Mission of Mercy programs. She serves on the ADA Council on Membership, as the 2019 first vice president of the Greater St. Louis Dental Society and as chair of the Missouri Dental Association Foundation Board. Dr. Jason Tanguay, of Bozeman, Montana. One year out of dental school, Dr. Tanguay was elected to the Montana Dental Association board of directors. In 2018, he served as vice president of MDA, making him the most junior officer in the society’s history. He led the MDA Medicaid Symposium and successfully lobbied on McCarren-Ferguson legislation in his state. Dr. Tim Treat, of Indianapolis. Dr. Treat is a clinical faculty at Indiana University School of Dentistry and serves as a comprehensive care clinic director, which allows him to work with faculty, staff and administrators to develop new pedagogical models that inspire students in clinical and didactic settings. Several other recipients echoed those sentiments. The winners of the second annual ADA 10 Under 10 awards will receive a $1,000 gift card and be recognized in various ADA publications and channels, including the ADA News, ADA New Dentist News and the New Dentist Now blog. Whittling the number of nominations to only 10 was a difficult process, Dr. Compton said. The committee members read through every application and the nominee’s CV. In addition, the applications gave the New Dentist Committee a fresh view of the accomplishments and concerns of new dentists around the country. 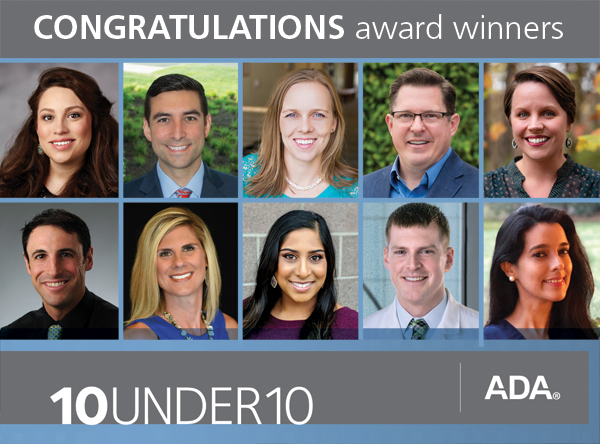 For more information on the 10 Under 10 award recipients, visit ADA.org/10under10. Congratulations to the winners! I really wish my dentist at Dr. Teeth Dental Care in Katy, TX would get featured and awarded here someday – she’s a really nice dentist with a very friendly approach and great treatments. Thankyou for sharing the list with a little brief about each one’s work and life. This should really inspire some young kids to take up the profession.